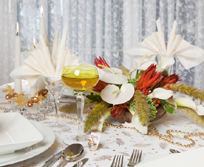 Incorporate a touch of the tropics into your traditional Christmas table decorations and holiday flower centerpieces. Create a unique holiday table display with tropical Christmas flowers, decorations, and specialty dinnerware. When planning the table decorations, choose textures and colors that remind you of your tropical locale; include exotic flowers, bold exotic colors, sun, surf, and sand. Mix tropical elements with traditional pieces. For an elegant display, use white or cream colored china with gold or silver accents. Place dinner plates on charger plates or place mats made out of a light colored bamboo or wicker. For a dramatic effect, choose jewel toned dinnerware in vibrant, exotic colors that resemble rainforest birds and animals with a dark woven table runner as an accent. For tropical themed table decorations, choose linens and accessories that reflect an island paradise. To create an elegant island atmosphere, choose neutral, sand-colored linens. Accessorize with deep brown napkin rings and turquoise napkins. Consider gold, silver, and seashell themed Christmas decorations for this Christmas table theme. For a tropical rainforest effect, choose bold, bright colors that are found in tropical flowers, plants, and exotic birds and animals. Consider using a banana leaf green table cloth paired with white china and bright red napkins, accented with tiki brown colored napkin rings and placemats. For this Christmas table theme, choose Hawaiian themed Christmas décor (colorful leis draped behind the chairs and a grass table skirt. Popular tropical Christmas flowers and plants during the holiday season include Poinsettia plants, Amaryllis flowers, Anthurium plants, and the Christmas cactus. Use these plants in flower arrangements placed on sideboards and dining tables. Create a simple centerpiece by arranging stalks of bamboo in a vase (be sure stalks are short enough to allow for conversation). Candles make an elegant display for an outdoor holiday event. Use a large hurricane lantern as a candle holder. Arrange several candles together, or add a large pillar candle. Candles can be white, turquoise, red or green in color. For an island Christmas theme, surround the bottom of the candles with sand, pearls, seashells, and gold or silver beads.